After a thoroughly satisfactory breakfast at a local diner, Tam K and I set out to visit National Moto+Cycle, whose storefront may be found in the same 1920s building as Luna Music and Indie Bike (around the corner). They already had eye-candy waiting out front: It's even prettier up close, though the guys were quick to point out that this is a prototype, lacking the custom paint and trim the production models will have. (Notice the helmets in the window, of which I should have taken a closer photo). Inside, Chief Designer Matty Bennett and his partner-in-vehicularity were waiting and filled with enthusiasm. 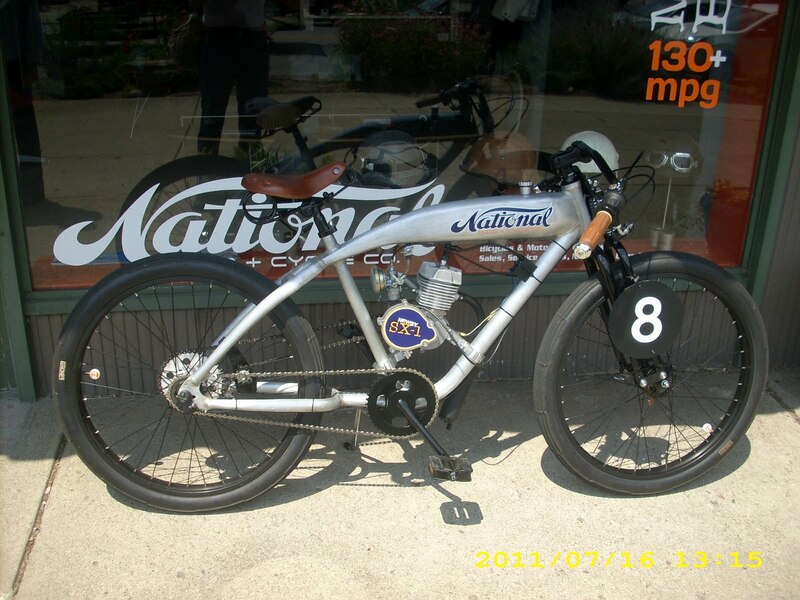 National's basic product is a bicycle, but one that hearkens back to the first two decades of the 20th Century, as the "safety bicycle" was at its peak and the first production motorized versions were appearing. But they use modern materials with far better strength-to-weight properties, to produce a bicycle of reasonable weight and retro looks. The race-style turned-down handlebars can be flipped, resulting in a classic recreational/practical bike, or replaced with even more upright "beach cruiser" style handlebars. The bike has a multi-speed kickback hub and optional disc brake system. ...Or you can add a motor! Matty describes it as "like an early production motorized cycle. They're not intended to go superfast," running at the same speeds as city traffic. He plans to add an electric version as well. (More info at this link). The internal-combustion version has a standard twist throttle, kill switch and hand brake. Sidecars will be available for all models -- they'll be kept lightweight, in keeping with National's goal of attractive, retro, useful vehicles. 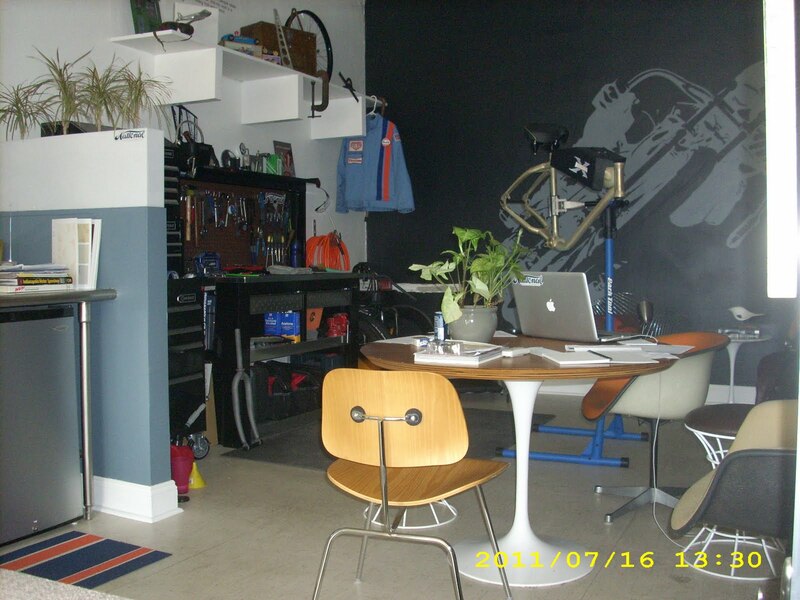 As you can see, even the showroom is something of a design engineer's dream. Both the name and the logo are not a new invention but the return of a very old Indianapolis automaker: between 1900 and 1924, the National Motor Vehicle Company built a successful line of internal-combustion and electric vehicles in their plant at 22nd and the Monon (rather a lot of photos here); the building still stands and is presently The Project School. Matty himself is the eye and hand behind the look of a number of Broad Ripple institutions, not the least of which is Taste. Between that talent, his background in bicycling, enthusiasm for these bikes and the history of National, I think we're looking at a winner. I've more photos, from National Moto+Cycle's secret basement proving grounds, but they must wait for another day. That is so totally Boardtrack heaven!! Just watch out for the oily 3-foot splinters! I am intrigued by the 'minimal' size of the slave sprocket on the rear wheel and also the fact that it's mounted on the port side. I have recently been pondering a way to mount a motor to a multi-geared cycle in such a way that one could select gears under power. Looking at the photo it seems as though one could relocate the slave sprocket to the port side of the crank and install a free-hub (?) so that the engine doesn't fling the pedals around when it's under power. With the engine drive on the port side, all the gear selections would still be available in their stock configuration...whether that be a simple 3-speed cruiser or a high falutin' 21-Speed mountain bike. The whole point of the exercise was to see if one could squeeze out better MPG, better MPH, or both (understanding of course there will be the 'tipping point' where gearing will overcome the work potential of the engine). Dude, you should totally contact Matty via his Facebook page. He is one driven dude, and would probably love bouncing ideas back and forth. Sadly I've got a bit of the Claire Wolf in me... I don't do the Facebook thing...or any other 'social media' for that matter. I'm pretty sure Matty's outside-accessable Facebook page lists his e-mail address. He's not a huge Facebooker, either -- National is working on a gen-u-ine webpage. FB is a styopgap. I know a couple of schnauzers that would love to cruise around in a side car. Just saw this post! A ton of things have been happening with NMC. The website www.NationalMoto.com is up and more info coming. Thanks for all your support! Phssthpok: We will have freewheel on the bikes for sure, currently with the single coaster the pedals are not driven by the motor. Flat pedaled and comfy. We expecting arrivals within the month of gas tanks, electrical bikes and just accepted as a www.feltbicycles.com dealer!